On an island on the edge of an immense sea there is a city, a forest, and a boy. The city is called Asteri, a perfect city saved by the magic woven into its walls when a devastating plague swept through the world years before. The forest is called the Barrow, a vast wood of ancient trees that encircles the city and feeds the earth with magic. And the boy is called Oscar, a shop boy for the most powerful magician in the Barrow, who spends his days in the dark cellar of his master's shop grinding herbs and dreaming of the wizards who once lived on the island. Oscar's world is small, but he likes it that way. The real world is vast, strange, and unpredictable. And Oscar does not quite fit in it. But it's been a long time since anyone who could call himself a wizard walked the world, and now that world is changing. Children in the city are falling ill; something sinister lurks in the forest. Oscar has long been content to stay in his small room, comforted in the knowledge that the magic that flows from the trees will keep his island safe. Now, even magic may not be enough to save it. While fantasy is not my preferred genre, I can't deny the flow, beauty, and simplicity of Anne Ursu's writing. The symbolism of Oscar's journey in discovering his own humanness was very real despite the fantastical setting. While Ursu herself has said that the main character of Oscar is not her son, it is clear Oscar's struggles are inspired by the fact that her own son is living with Asperger's, which is made further evident when you notice that the book is dedicated to him. And even though fantasy is not my preferred genre, I love that Ursu found a way to write a story about a boy with Asperger's and place him in a fantastical setting rather than a typical real-life one. This is not a straight-up "issue book", which is refreshing to see a boy with Asperger's portrayed as the hero of a fantasy world rather than just a boy in a realistic fiction novel who learns to live with his special need. Not that those stories aren't powerful in their own right, but seeing a special needs character move beyond a typical "issue book" is a giant step forward in children's literature. For that reason I hope this is a book that the Schneider Family Book Award committee will take into consideration. 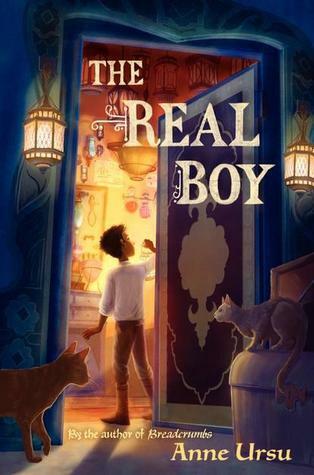 Obviously there is a lot of Newbery buzz surrounding The Real Boy, but Schneider Award recognition would be a lovely testament to the beauty of this story as well.